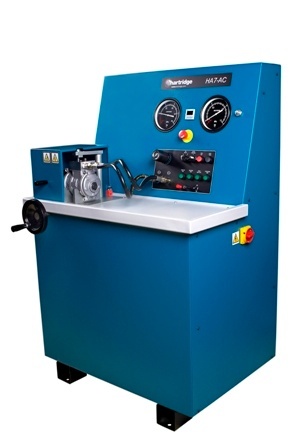 The Hartridge Air Conditioning Compressor Test Stand HA7-AC has been designed to provide a cost effective, simple to use, flexible test and repair solution for the aftermarket air conditioning specialists. Denso approved; the HA7-AC tests Denso 7SB(U) and 10PA compressors and with additional accessories tests a wide range of other compressors. Simple to use and flexible. Tests a wide range of compressors. 150mm diameter, -1 to 4 bar / -0.1 to 0.4MPa. Scale resolution 0.1bar / 0.01MPa. 150mm diameter, -1 to 15 bar / -0.1 to 1.5MPa. Scale resolution 0.5bar / 0.05MPa. Range 99 min 59 sec. Three phase & Earth, 400V ±10%, 10A continuous, 50 Hz. Clean, dry pressurised air, minimum pressure 5.5 bar (80 psi)/maximum 8 bar (116 psi). 7SB(U) and10PA compressor adaptor blocks (mount onto top of compressor for connection of hoses). Electrical cable assembly (powering of control valves).